Remember the VIX? Probably not. Wall Street's measure of volatility has been pretty forgettable in 2012. Not on Friday. The CBOE Volatility Index (VIX) spiked by as much as 10%. 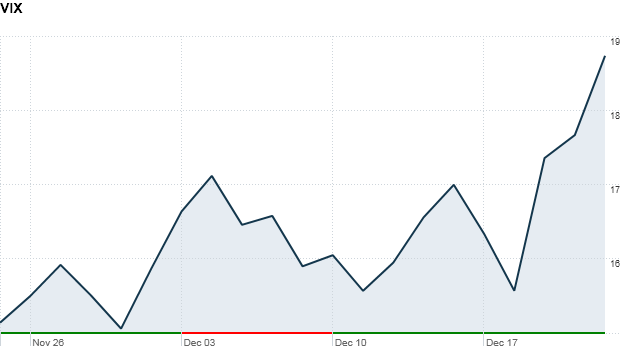 The index itself was particularly volatile Friday, closing up just 1%. Congress and its inability to come together over the fiscal cliff wasn't the sole trigger of the heightened volatility. Friday was also quadruple witching day -- one of four trading days a year when investors close out futures and options contracts. Both types of contracts or derivatives let investors bet on the future price of a stock or any other type of asset. Trading volume typically spikes dramatically on "quad witching" days. Today's sharp move up is one of the few big daily moves for the VIX this year, and even after the Friday surge, the VIX still hovers just below 19. That's well below 30, the level seen as indicating investor fear. The VIX hasn't hit 30 in 2012. As all three stock indexes have moved higher, the VIX curiously has stayed flat but trended lower overall. It's down 24% in 2012. Last year, following S&P's downgrade of the U.S. credit rating, the index climbed as high as 50. Meanwhile CNNMoney's Fear and Greed Index, which includes the VIX among other sentiment measures, has moved into neutral. On Thursday, in fact, the index was far into "greed" territory. Even with Friday's VIX moves, the days when the Dow inked several hundred point gains and losses regularly seem distant. Of course, Congress could possibly change that quickly if it tries hard enough.